Baby's Claddagh bracelet is cast in sterling silver and it is our best selling piece of Irish baby jewelry! This Irish baby Claddagh bracelet has been hallmarked sterling silver by the Irish Assay Office at Dublin Castle in Ireland. This baby size Claddagh bracelet is crafted in engraved sterling silver; it measures 5/16" tall from the top of the crown to the bottom of the heart. The expandable opening on the child's Claddagh bangle ranges from 1 3/4" to 2 1/8" wide. The child size bracelet is made by Solvar Jewelry in Dublin, Ireland and it is gift boxed with a Claddagh legend card, complements of The Irish Gift House. Sterling silver Claddagh bracelet is ideal for a baby or small child. 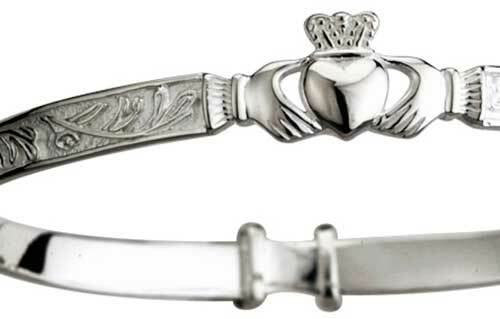 Child's Claddagh bracelet is an adjustable bangle that is crafted in sterling silver. Sterling silver History of Ireland expandable bangle is a child's size bracelet.